Stuffed Eggs with Ham & Cheese, sprinkled with a dash of Spanish Smoked Paprika (affiliate link), are super meaty, cheesy and satisfying. 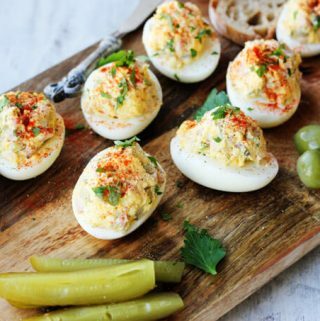 The subtle heat from the smoked paprika marries everything together to create a perfect egg bite. These are a MUST for your Easter table. They’ll definitely be on mine. Easter is a really big thing in Poland. It actually lasts for two days: Sunday and Monday. And of course, there are plenty of traditions during the days leading up to Easter. For instance, on Saturday we would go to church with a little basket filled with different food groups: eggs, bread, ham, babka, fruit, etc., and have it blessed. Traditionally, after this ceremony we were allowed to eat the meat; signifying the end of lent. What was great about it was that you could see all different colored eggs in everyone’s Easter baskets. Obviously this aspect of it was a huge crowd pleaser for the kids. Afterwards we managed to eat ALL these eggs within the next two days. My mom would always come up with some sort of stuffed eggs and I loved them. Even though I’m no longer as zealous about church, I do want to keep some of these traditions alive so my two little boys can enjoy them too. So, for every holiday I’m always cooking traditional Polish meals. 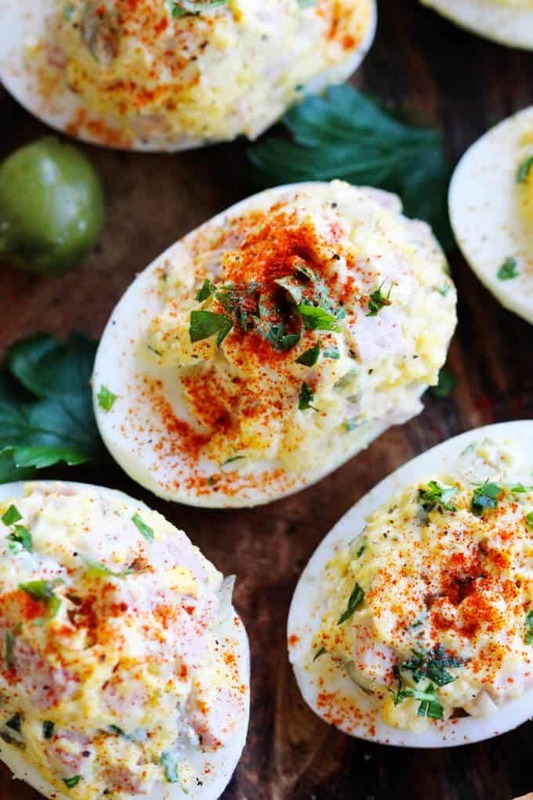 For example, I would cook these Pierogi with Potatoes and Cheese and Pierogi with Mushroom and Sauerkraut for Christmas, and these stuffed eggs for Easter. That said, these Stuffed Eggs with Ham & Cheese is actually a play on traditional Polish recipe. 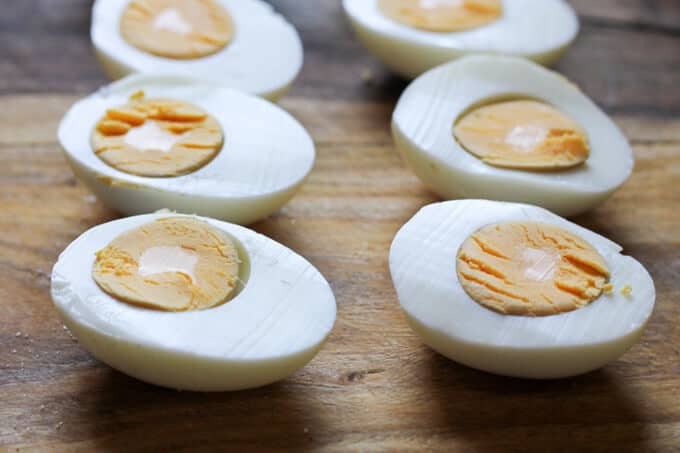 The conventional way of eating eggs for Easter was to: cut them in half, place them flat side down, and cover them with mayo. 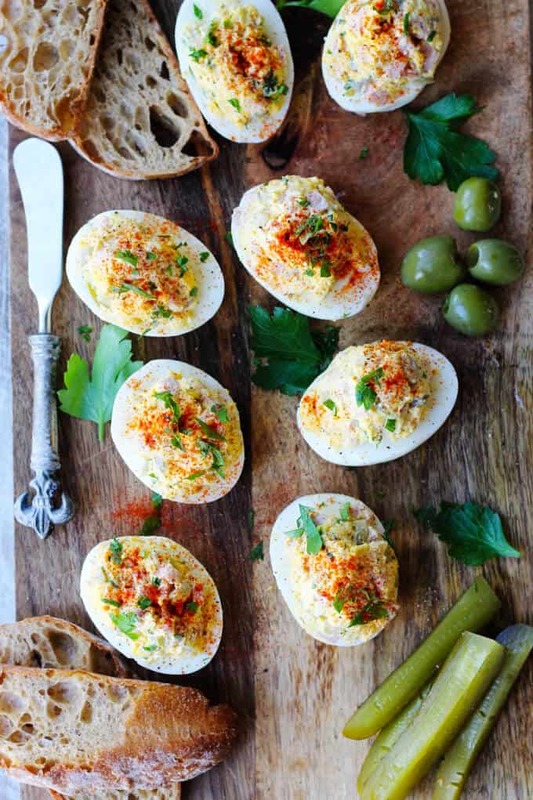 Creatively, these were called ‘Eggs in the Mayo.’ Don’t get me wrong, I love this way of preparing them too. In fact, I make them every year for Easter. The only twist on this traditional recipe is that I just sprinkle some green onions on top. 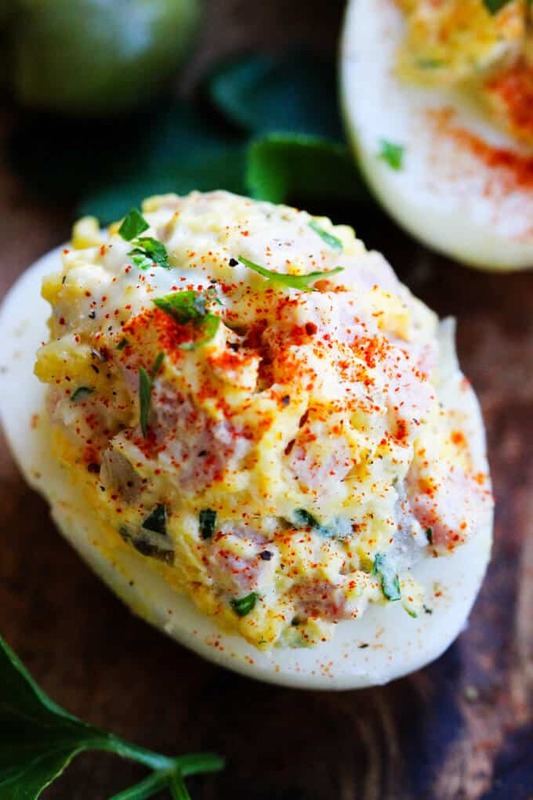 Anyways, this recipe for Stuffed Eggs with Ham & Cheese is very simple, but they’re more of an undertaking than just a bite of your regular deviled eggs. Caution: this is not a one-bite type of egg! You’ll need to take it down it two. But they are so good. Spanish Smoked Paprika (affiliate link). Don’t add salt to it until you mix everything together and taste it. I actually didn’t need to add any salt. All of these ingredients had enough saltiness for me. But it is a personal preference, so try your mixture and adjust accordingly. 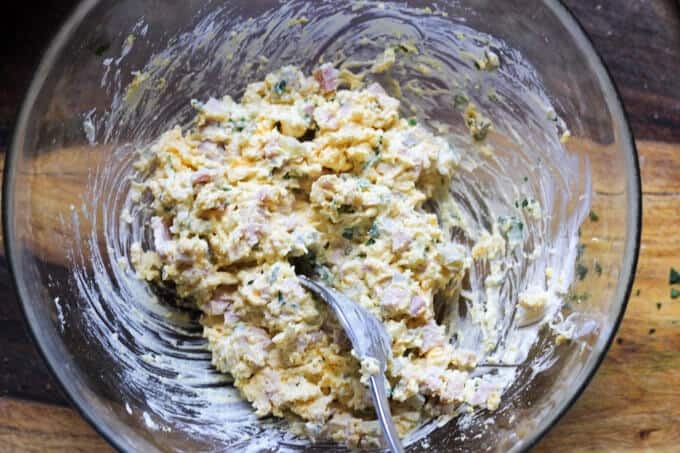 Once mixed, fill up your egg whites, sprinkle Smoked Paprika, and a dash of parsley or chives, and you’ll be a superstar this coming Easter. Oh, and I forgot to mention…on Easter Monday (which is an official Holiday – ie, no school & no work) we pour water on each other. If you’re interested about the origin of this tradition check it out on Wikipedia. In a pot bring the water to boil. Add eggs and cook them for 10 minutes. remove from the pot and cool of in cold water for 10-12 minutes (depending on the size of the eggs). 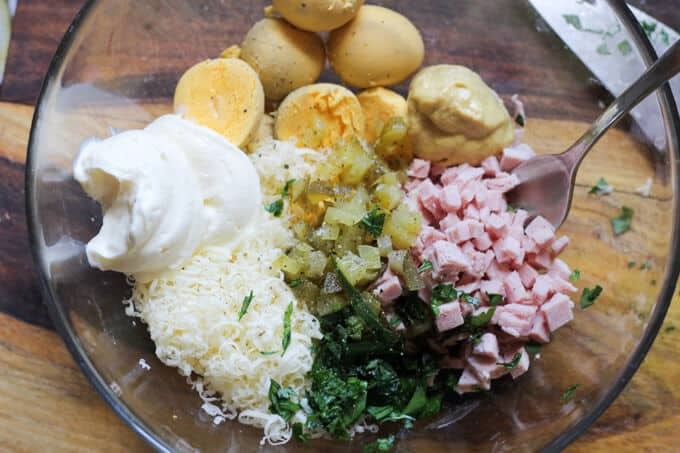 Cut the ham in a very small cubes, shred the cheese and add both to the bowl with the egg yolks; Add chopped parsley, cut up pickle, mustard, mayo and black pepper. Mix well. Fill out the egg whites with a spoonful of egg yolk mixture; sprinkle with smoked paprika and some more parsley. Serve and enjoy. *Before adding eggs to boiling water, make a hole with a needle or a little gadget like the one described in this post to avoid shell breaking. **You can also add eggs to cold water, bring it to boil and cook them for 10 minutes. I really like the combination of the ham, gruyere and the smoked paprika in this recipe. Thanks. What an amazing appetizers, your photos are gorgeous! 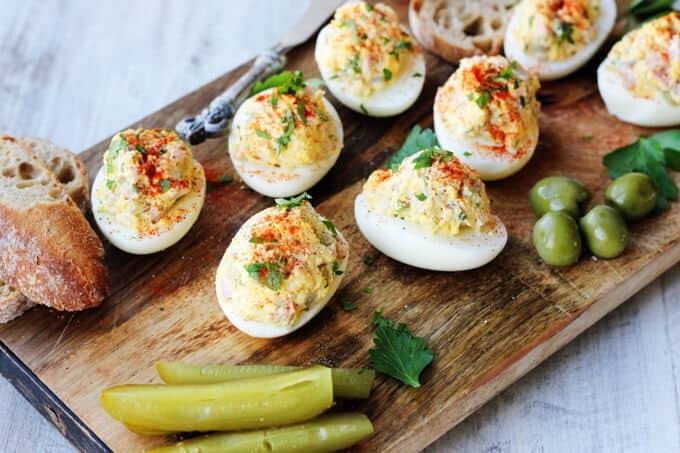 I simply adore deviled eggs!! I love that you added ham! Easter was a big thing in my family too, but it didn’t last for days! But that sounds fun! I’m going to try your recipe for Easter this year!! Thank you Elaine. I hope you’ll like them! These sound so flavorful! I love everything in them! 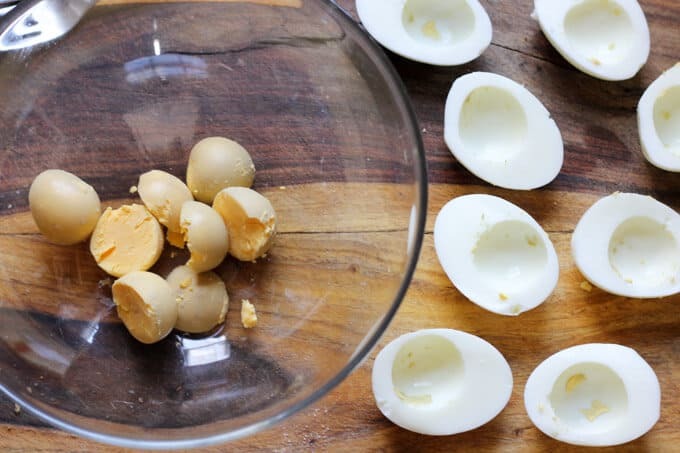 These will be a great recipe to use after Easter to use up all those eggs! These are SO pretty! For Easter or any brunch. 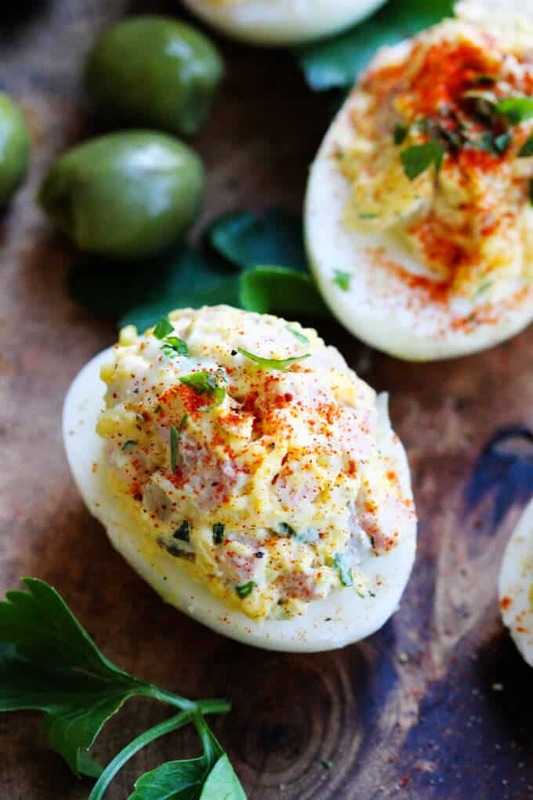 Love the flavors and LOVE the sprinkle of paprika on top.